Tacos are an easy weeknight meal, but sometimes you need to change up the presentation. These taco wonton cups are definitely a crowd pleaser, and kids love them too! These mini vessels have a light and crispy crunch followed by a kick of salsa verde shredded chicken inside. What makes these Taco wonton cups easy to prepare is the 2 ingredient salsa chicken as the base. Yes, you read that right, just 2 ingredients for flavorful, juicy shredded chicken. Use your favorite salsa (I like Trader Joe’s hatch green chili salsa), and add chicken breast to crockpot and cook on high for 4 hours. * Update (July 2017)- I made this Salsa Chicken in my Instant Pot. I placed partially frozen chicken breast and 2 cups of Green Chili Salsa and cooked on high pressure for 20 minutes. Same results as the crockpot but in 20 minutes!! If you’ve been debating on getting this magical gadget, I highly recommend it! To assemble the taco cups, spray a 12 cupcake pan with cooking oil and preheat oven to 350 degrees. Carefully place wonton wrapper into cupcake pan and press down lightly. You can find wonton wrappers at your local grocery store usually next to tofu or other refrigerated Asian products. Spay top of wrappers with cooking spray again and bake for 8-10 minutes or until edges are light brown. Keep an eye on them since they can over bake easily. Remove from oven and keep wontons in cupcake pan. Add a spoonful of shredded salsa chicken into each cup and top with shredded cheese. I like pepper jack to give it more spice. Place back in oven for about a minute or until cheese is melted. I usually turn the oven off once the cups are done and just use the residual heat to melt the cheese. Once the cheese is melted, remove cups from pan and assemble with toppings. Add shredded lettuce, tomato, and *Greek yogurt. I started replacing sour cream with plain Greek yogurt, and my family actually prefers the taste better than sour cream, plus it has more protein. Win win! I served these with a side a black beans for a complete meal. Let’s just say we didn’t have any leftovers! 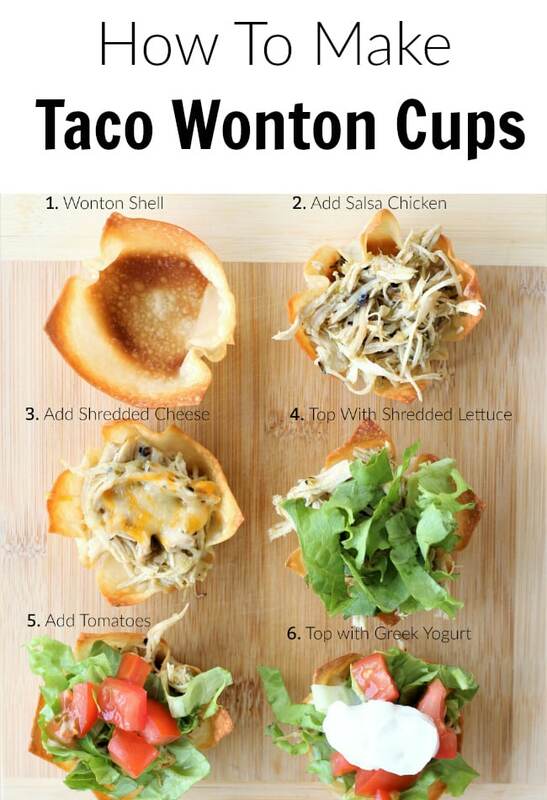 Try these wonton taco cups for your next taco night or as an appetizer for your next party. Either way they are sure to be a hit! Baked Wonton wrappers are the perfect twist for Taco Night. Fill them with Salsa Chicken and pile on your favorite toppings. Spray a cupcake pan with cooking oil and preheat oven to 350 degrees. Carefully place wonton wrapper into cupcake pan and press down lightly. Spray top of wrappers with cooking oil. Bake for 8-10 minutes or until edges are light brown. Keep an eye on them since they can over bake easily. Remove wontons from oven and keep in cupcake pan. Add a spoonful of shredded salsa chicken into each cup and top with shredded pepper jack cheese. Place back in oven for about a minute or until cheese is melted. I usually turn the oven off once the cups are done and just use the residual heat to melt the cheese. Once the cheese is melted, remove cups from pan and assemble with toppings. Add shredded lettuce, tomato, and Greek yogurt or sour cream. Recipe for Salsa Chicken, but I used Green Salsa instead. These are so fun! And how exciting it is that you are on tv :).